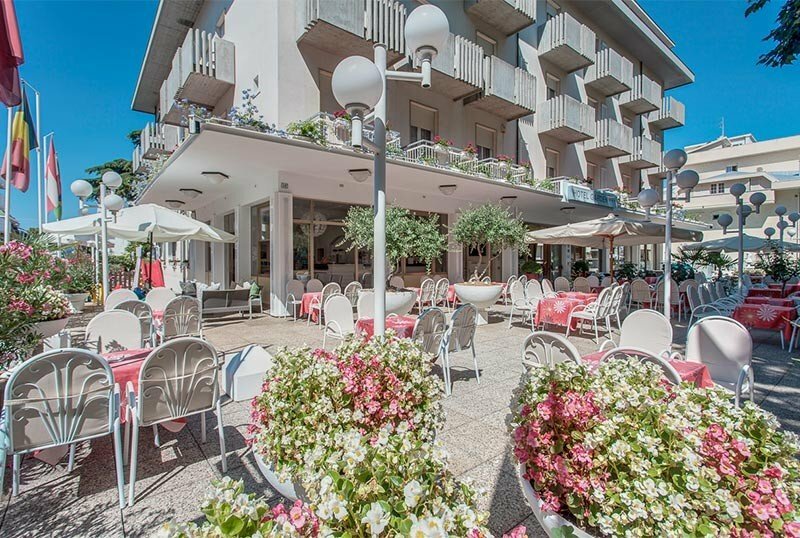 The 3-star Hotel Garden in Igea Marina offers its guests parking, air-conditioned rooms, WI-FI connection and large balconies. The kitchen offers traditional Romagna recipes with particular attention to children with specific menus. Small pets allowed. It is a five minute walk from the beach of Igea Marina, not far from the town center, near the pedestrian area where the main shops and clubs are located. The rooms have air conditioning, balcony, WI-FI, satellite TV, direct dial telephone, safe, private bathroom with shower, hairdryer, complimentary toiletries. Different types are available. COMFORT : welcoming and modern spaces. The shower is complete with a box and there is always a balcony. ECONOMY : can accommodate from 1 up to 5 beds. The balcony is smaller and some rooms in this category are attic. Garden, terrace, 8 bikes available, lift, library in several languages and newspapers. PARKING : free, 30 places available. BREAKFAST : buffet, sweet and savory. LUNCH AND DINNER : three menus with choice of fish, meat, romagnola recipes and a buffet of vegetables and appetizers. Sweets buffet. VARIATIONS : vegetarian dishes and baby menu. In the hotel : bicycles with child seats, outdoor playground area and pediatric counseling on request. In the room : tubs for the bathroom, safety rails for the bed, cots. At meals : seats, a set of colored placemats, dedicated menus, flexible hours, a fridge for parents even at night. The hotel has an agreement with "La grande spiaggia", with a playground and entertainment.